Barrel of Monkeys celebrates the season with THAT’S WEIRD, GRANDMA: Holiday Stories, a festive line-up of sketches and songs written by kids and inspired by the holidays, winter, elves, gift-giving and much more! THAT’S WEIRD, GRANDMA: Holiday Stories will play Mondays at 8 pm – plus a special weekend of added holiday performances – from December 4 – December 23, 2017 at the Neo-Futurist Theater, 5153 N. Ashland Ave. in Chicago. 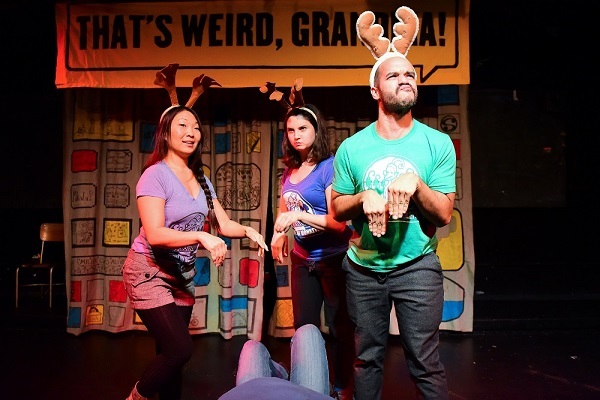 Directed by Artistic Director Brandon Cloyd, THAT’S WEIRD, GRANDMA features stories conceived and written by Chicago elementary school students and adapted for the stage and performed by Barrel of Monkeys Company Members. THAT’S WEIRD, GRANDMA: Holiday Stories features Barrel of Monkeys Company Members Ashley Bland, Barry Irving, Mari Marroquin, Meredith Milliron, Deanna Myers, Caleb Probst, Bradford Stevens, Mary Tilden, Gwen Tulin and Rawson Vint. Clever and funny – touching and poignant – the collection of short sketches and songs featured in THAT’S WEIRD, GRANDMA is equally entertaining for adults and children. The line-up of the long-running, critically-acclaimed revue changes each week by audience vote, so no two shows are ever the same. Barrel of Monkeys, a Chicago-based arts education theater ensemble now in its 21st season, conducts creative writing workshops with 2nd through 7th grade students in underserved Chicago Public Schools and in its own after-school program. The ensemble of actor-educators then turns their stories and poems into professionally performed theater, presented both in-school and for the general public through its revues. Barrel of Monkeys annually performs more than 300 stories for the students in their schools and 175 stories on the stage for the general public. Curtain Times: Mondays at 8 pm. Added performances: Thursday, December 21 at 8 pm, Friday, December 22 at 8 pm and Saturday, December 23 at 8 pm. Brandon Cloyd joined Barrel of Monkeys (BOM) in 2007 and has been deeply involved in many facets of the company ever since. Prior to joining BOM, Brandon graduated from Northwestern University with a Bachelor of Arts in Theatre and a minor in Business Institutions. Within BOM, Brandon has served as an actor, teaching artist, lead teacher, a member of Teacher Corps, as well as directing shows for schools and public performances of That's Weird Grandma. He has also held the role of the BOM After-School Program Coordinator at Loyola Park from 2014-2016 and the Program Director since the summer of 2016. Outside of Barrel of Monkeys, he worked as the Associate Director of Camp Echo, where he has spent 13 summers managing campers and staff at a co-ed sleep away camp in Upstate New York. Brandon has worked with other theatre companies including Urban Theatre Company, American Theatre Company, Filament Theatre, Ingen Productions, ACLE's Teatrino in Italy and Purple Crayon Players at Northwestern University.